At JSP, we never cut corners on quality. 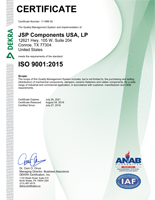 As an ISO 9001:2015 certified company, we are continually performing at the industry’s highest level of quality management systems. This enables our customers to achieve the confidence needed to ensure the quality and performance they deserve. The ISO 9001:2015 standard proves that quality is not a coincidence. JSP is committed to demonstrating to current and future customers that we will consistently meet and exceed their expectations. Our operations, procedures and functions are structured in a cohesive process, helping us meet customer demands while maintaining production efficiencies. Our culture of quality translates to lower production costs, improved efficiencies, fewer mistakes and maximum value on every component we ship. In addition to our own high-quality standards, we align ourselves with quality manufacturers (in the U.S. and abroad) and we export the best U.S. products to the European components markets. We are committed to quality assurance and we diligently comply with European regulations. 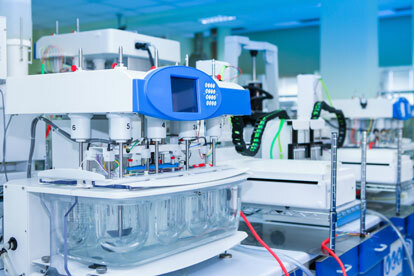 RoHS and REACH are some of the standards consequently met.